What is relaxing, romantic, and red all over? 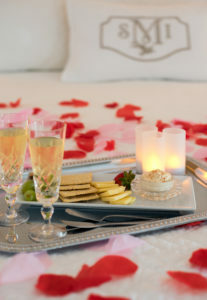 The scenic and charming coastal town of Kennebunkport, Maine, during the “Paint The Town Red” February romance events! Heat things up with your sweetheart during this cold winter month with dining and dancing, shopping, and continuous cuddling on an indulgent Valentine’s Day getaway. Who needs Paris when you have the romantic town of Kennebunkport bursting with the colors of red and pink during this annual event. From “red tag sales,” and “red plate specials” at local restaurants and shops, couples can enjoy decadent dishes, soothing spas, wine tastings, and luxurious lodgings. Your perfect date day/night wouldn’t be complete without a relaxing stay at a cozy inn. Mainstay Inn & Cottages sets the intimate scene for lovers with suites decorated in twinkling gold fairy lights, local Maine sparkling sodas for two, and oh-so-sweet chocolate desserts. Splurge on a cottage suite with a fireplace and a Jacuzzi tub to add some extra heat to your stay. A gourmet breakfast of French toast with poached eggs and baby field greens delivered to your suite in the morning, will produce declarations of everlasting love to your partner and to the innkeepers at this warm and welcoming inn. Take the time to show your love how much they mean to you with a romantic trip to Kennebunkport during “Paint The Town Red.” All business in Dock Square in downtown Kennebunkport will be adorned with red twinkly lights that will surely set the stage and the mood for an unforgettable romantic retreat. This entry was posted in Romantic Getaways, Valentine's Day by acorn. Bookmark the permalink.